As-salamu alaykum and hello everyone ♡. It seems that you guys a very excited for this. Glad I can make the review as fast as I could. I receive a few items from Makeup Revolution. Makeup Revolution is a UK base brand that recently has landed in Malaysia. A lot of YouTubers has talk about this. And if you look through their products closely, it might reminds you to a certain other high end brand in terms of the packaging and concept of product. The different about their product and the product that they look similar to is, that they are amazingly affordable. As low as RM8. I’m not kidding. There will be more Makeup Revolution review coming up! So let start with this one first! 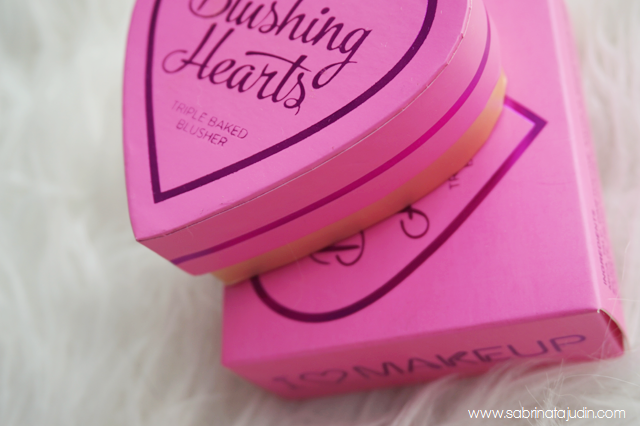 Today I will be reviewing this really beautiful blush from their I Love Makeup range. What I like about it. Of course. Got to admit. The packaging. Just so cute. If you look closely I actually accidentally dropped it and the blush break into 3. Told you I am a super clumsy person. Glad it can be combine back and does no break into pieces. I love how it has 3 different shades. And you can get different shades of the each stripe. The texture is smooth and a little goes a long way. Again I love blush that comes in card box packaging. I find it is more durable and cute! Also this blush has a dome 3D shape, it makes easier to be swipe with my blush brush. There is also a fine gold flex in it, and I find it looks super pretty! But make sure not to apply it too much ok! What I don't like about it. I think none. 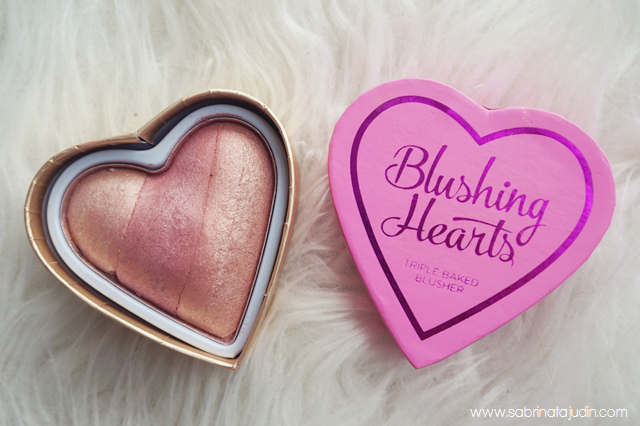 So far I have been loving this blush although is shimmery. I don’t really like shimmery blushes but this is just too pretty to resist. A little goes a long way. So if you take the product too much you will ends up looking like a clown of course. Or maybe the design of the blush. They have different pinks for the Blushing Heart range but the box looks similar. I love product that have different packaging for different shades. Easy to identify and looks nicer when storing. Nah, that is not a big deal anyway. Overall & Recommendation. For the price wise and to the design of the blush. It's a heart shape! How can you not say its not pretty. This is a must have for all beauty junkie lover. 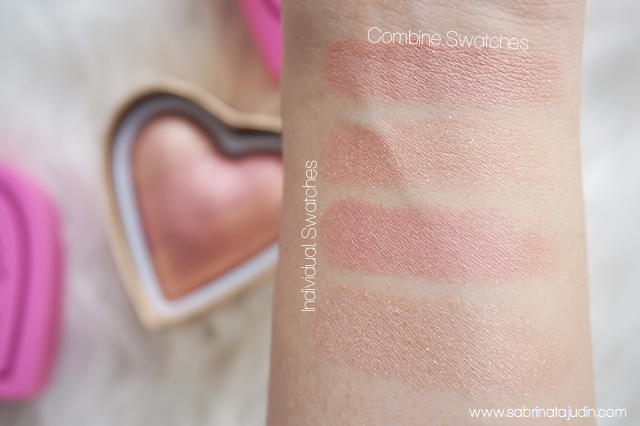 I never tried the Too Faced Sweetheart blush yet, but they definitely look similar and the texture is similar to base on my experience swatching it in Sephora. Baked blush are usually shimmer and they are smooth and highly pigmented. If you love baked blush/shimmery blush (most of them have shimmery finishes) with a cheaper price than the Too Faced one. This is a go. I look forward to collect the others too! The Goddess of Love looks pretty! Shades available are as below! comel giler packaging n the colours.. harga pun affordable <3 tempted! sab pn tempted nk tmbah lagi.... haha! cantik kann! hard to resist! i know right! hehe... semua cute2 cantik2.. sold instantly! I don't know why my bloglist of your blog did not update,so I missed this post! 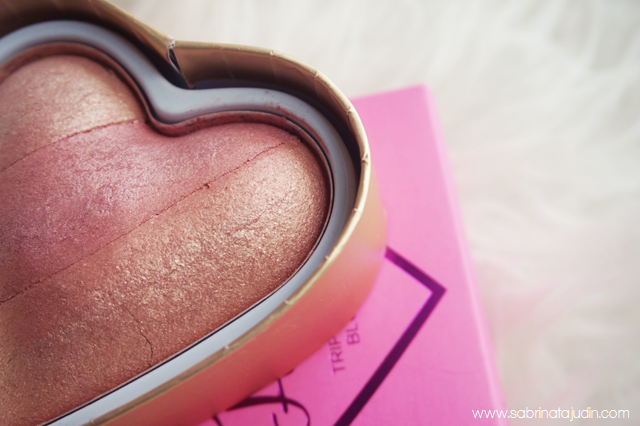 I fall in love of this blusher when the first time I look the packaging... So pretty ! Swatches dia nice gila. Suka! wah~ cantiknya~ plus the prices are sooooo affordable! I've been wanting to get the Iconic palettes ever since I saw it! 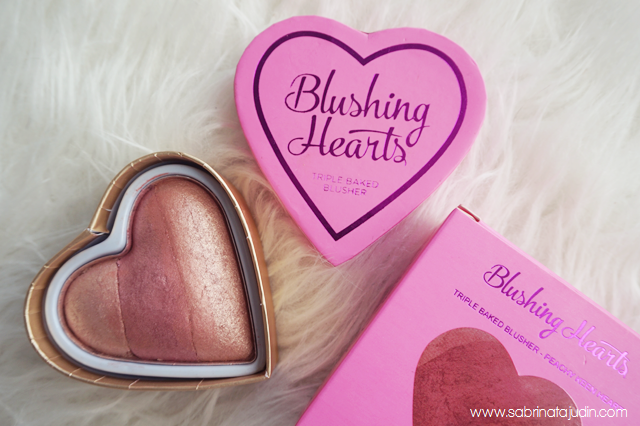 Me too, is actually not a big fan of shimmery blushers but indeed the packaging is too cute to resist! But I love the colours. so subtle. I'd love to get Peachy Keen. Thank goodness you did this review. was searching high and low for a review by someone with yellow undertone. you rasa this 'peachy keen' gives colour to the face or it acts more like a highlight? cantik kannn! harga pun afforable. I got the one in Queen of Hearts.. So cute! I'm a sucker for pink and hearts. <3 you will love it! you should check it out, its very nice!